Several important races are taking place in Seneca County, which will have long-term impacts on life for those voters getting ready to cast a ballot. The race for District Attorney has maintained it’s competitiveness — despite the incumbent, District Attorney Barry Porsch successfully fending off a primary bid by challenger Joe Sapio. Sapio stayed in the race after winning the Conservative and Independence lines. Both have exchanged barbs over the last several weeks, setting up for an Election Day battle on November 7th. In Junius, outgoing Town Supervisor Greg Wadhams lost his primary bid to continue onward leading the rural northern town in Seneca County. He lost to Town Board member Ernie Brownell, a Republican, who will take on former Town Supervisor Ron Serven. 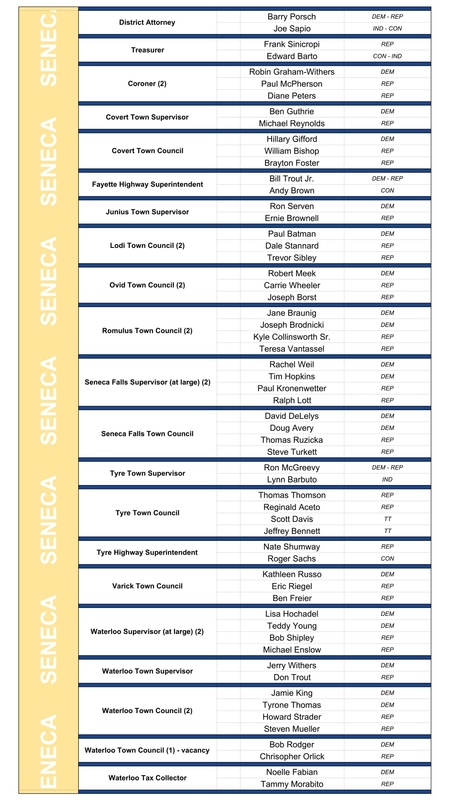 Four at-large seats on the Seneca County Board of Supervisors will be elected in Seneca Falls and Waterloo. Both communities will have to choose two, each, to represent them for the next two years. Seneca Falls will also elect two Town Councilors, which will play a major role in one very divisive issue, which has polarized the community for several years. Check below for all of the contested races, and candidates on the ballot November 7th.